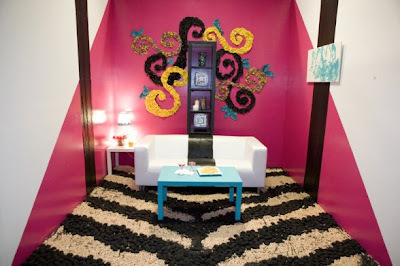 Last night's HGTV Design Star featured "The White Room Challenge." This is by far my favorite challenge in the series. The designers were given $1,000 to spend at a grocery store and their task was to use their grocery store purchases to design a completely white living room in 15 hours. These were my favorites from last night. I totally loved that guys orchard room! I loved how the guy pourmiilk down the walls but I didnt like his blue tables...I cant believe they didnt get rid of the chick with sloppy lines and using the table on the wall.Sorry so long no one else I know watches that show. 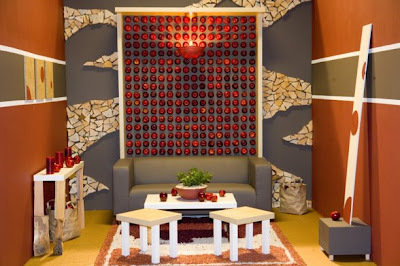 I know, the orchard room was greatly executed!! I totally thought the girl with the sloppy lines should have gone too, her work was horrible!! 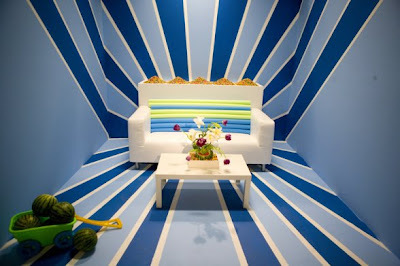 Wow, these rooms are truly amazing! I can't even imagine trying this challenge myself, and to come up with what they did is true creativity. I get creativity envy sometimes. Think I've got it now for sure!